With the day off on Friday we decided to head to Wilder Ranch for some coastal biking. I had mapped out a trail starting from the parking lot to the coast, along the coast for a few miles, and then back inland to a supposed tunnel that takes you across highway 1. The temperature was near perfect while riding and the coastline was beautiful. It's an easy trail that would be perfect for anyone. We ended up going 14.25 miles total, but if I was to ride this again I would turn around near the last beach unless I am in need of more exercise. The trail is supposed to go down to the first beach and then back up to the bluffs on the other side unless there is high tide. You can see a photo of a nice couple taking their bikes down (Sorry guys I forgot your names. Duffy? So I hope you find this photo of you below somehow :) ). Unfortunately we soon found out that a large puddle was preventing us from getting to the trail on the other side. A hiker would have no problems, but getting the bike across looked messy and wet. We took our bikes down anyways for photos, and then came backup the path we came. The detour added a couple miles to the trip. Some of the trail was extremely grassy, to the point you had just keep spinning the tires. My chain picked up a lot of grass which you can see in the photo. I had my kit lens and a new wide-angle lens for photos but I had skimped on a tripod and my telephoto lens and regretted both. I had my gorilla-pod but no real trees or rocks to attach it to. I would have really liked to have a lightweight full size tripod for some sharper shots. 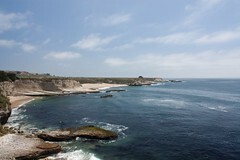 It was a wonderful day which ended in a trip to Santa Cruz for a beer and shopping. I picked up some wonderful new flip-flops to replace my $7 Tevas I bought in 2005. I will post some more photos when I finally wade through them all and pick my favorites.